This hunchback “Everyman” of James C. Christensen’s symbology is not only thinking outside the box, he is outside of his box. He’s arrived, and if he had any trouble getting here, it’s behind him now. It’s like getting up very early in the morning, before everyone else, and taking that quiet time to reflect. 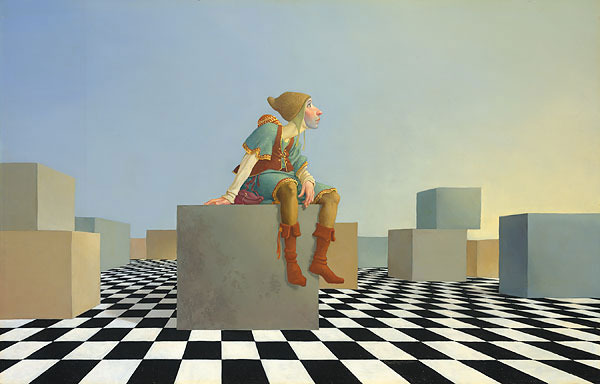 It’s a perfect moment, sitting on the checkered game board of life, and contemplating a cloudless future. In a couple of hours he may be joined by others, or maybe not, but for now the sky’s the limit, the air smells great, and the possibilities are endless.